It is believed that already in prehistoric times there was a fortification on top of Mt. Quarin. This fortification became the Castle of Cormons, then a Celtic centre and finally turned into a Roman castrum, a military defensive position. In the 10th century a second castle was built on the foothills of Mt. 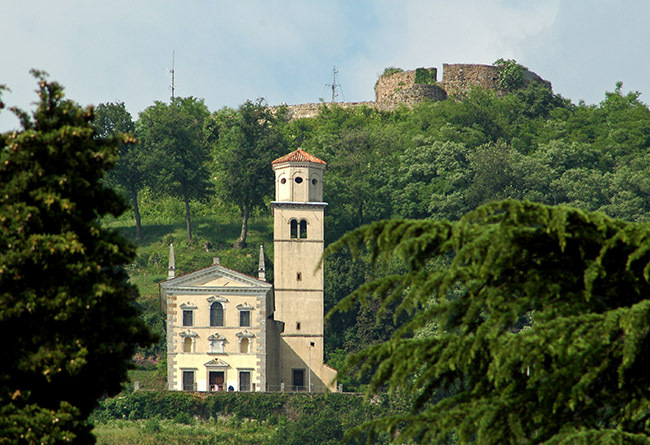 Quarin and the villa long-disputed between the Patriarchs and the Counts of Gorizia was finally enlarged. In the 12th century this villa was fortified by adding two surrounding walls, whose ruins are still visible today. In 1497 the fortified building passed under the House of Habsburg but was then conquered by Venice in 1511. On this occasion the Venetian troops destroyed the existing castle and built a new fortress over the ruins of the former. On the basis of the ruins it has been possible to ascertain that this fortress was circular. Foreground: the church on Mount Quarin.